While the butcher shop may have violated the health codes of 30 different countries (see The Great Goat Adventure), the goat meat smelled fresh and looked great. While I played around a few times, I believe I found the right combination of water, coconut milk, and other ingredients to make this a surprisingly tasty yet subtle dish, particularly hard with it being a curry. 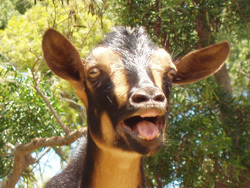 The goat, to be honest, could easily have been lamb were it not for the deeper color of the meat. This dish was quite good, and one could easily substitute any other meat (lamb, chicken) in place of the goat with equally good results. 2. 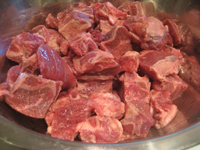 Cut the goat meat into cubes (or have your butcher do it for you, it’s easier). 3. Put the meat in a bowl or bag and add half of the lime juice, mixing it all up to coat all the meat with the lime juice. Marinate the meat for at least 2 hours. 4. Remove the meat and sear in a pan in vegetable oil until relatively brown on all sides. This should be done a few pieces at a time to keep the heat as high as possible. 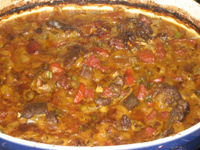 Adding too much meat to the pan at one time will prevent proper browning as it will reduce the heat too much. Contrary to the popular myth that this “seals in the juices,” this step is actually done in order to add flavor to the finished dish, as the browned parts of the meat will contribute a richness to the final product. 5. 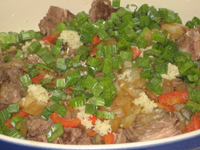 Place the seared meat in your crock pot, dutch oven, or dish, whichever is your cooking preference. 6. Add the onion, chopped, to the pan in which you seared the meat without cleaning it (all those brown pieces in the pan will also add flavor). Saute the onion at a medium temperature until they are translucent. When done, add the 1 cup of water to the pan and deglaze (this is a step where you use the liquid to scrape up any remaining brown specks in the pan, you want these for their ‘yum’ factor). Add all of this to the dish with the goat meat. 7. Add the remaining ingredients to the dish. 8. Bake in the oven at 350 degrees for about 3 hours. 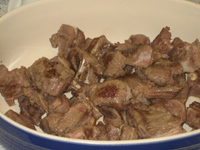 You want this to cook long enough for the goat meat to become flaky and tender, which will take time. You can use a crock pot, pressure cooker, or any kind of dish. If you use a pressure cooker it will only take 40 minutes to an hour or so to cook. My preference is in an open dish in the oven so that the curry browns under the heat. 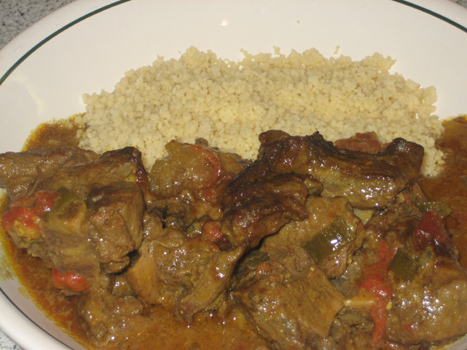 Traditionally this is served with rice, but I used couscous. The choice is yours as almost any starch will do.